Fall is a season of transition and big swings in weather; snow has already fallen in the Front Range of the Rockies, while warm and humid conditions hung over the East Coast as recently as last week. 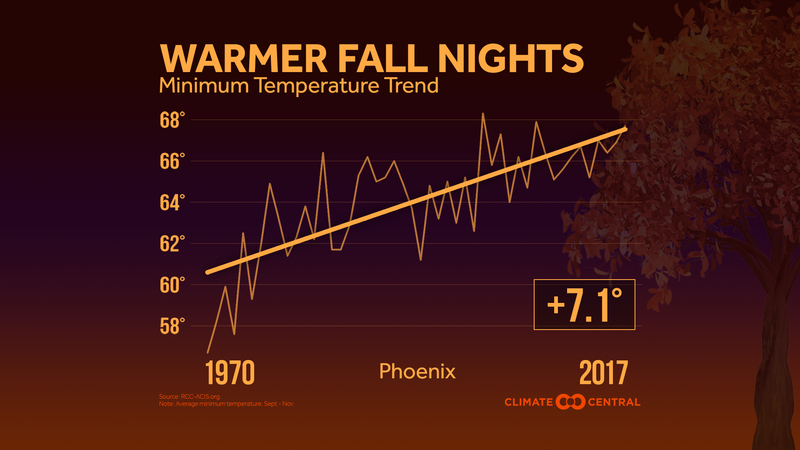 As the climate changes, fall is not as cool as it used to be, and cooler weather is being delayed until later in the season. This change affects the growing season, the allergy season, the insect population, and fall foliage. We expanded our previous October low temperature analysis to include the entire fall season and found that for the 244 cities in the U.S., 83 percent have average fall low temperatures on the rise. Warming fall nights mean more than just a delay in pulling out those comfortable sweaters and drinking hot apple cider. The lack of cool nights effectively lengthens the summer, as the first frost of the year also comes later. While warm-weather fans may celebrate, this also means that disease-carrying pests like mosquitoes and ticks will persist longer before dying off in the winter. Nationally, the long-term warming trend has lengthened the growing season by two weeks compared to the beginning of the 20th century. The allergy season is also getting longer, with ragweed pollens not disappearing until the first freeze of the fall. Each ragweed plant can produce up to one billion pollen grains, which can cause sneezing, itchy eyes, and worsening asthma conditions. Hospital visits related to asthma spike during periods with high pollen concentrations. The warming also affects fall foliage. Each type of tree responds to its environment in a different way, but in general, warmer weather delays the changing colors. But complicating things, climate change leads to more weather extremes, like high heat and drought, which can stress trees enough to make their colors change earlier and their leaves disappear faster. The vibrancy of the colors is not just aesthetically pleasing, for some states it’s an economic driver. Tourists will travel long distances to see the fall colors, providing a financial boost to the local businesses, but a less predictable foliage season in a changing climate puts this consistent economic boost at risk in the future. Methodology: Individual city temperature trends are calculated using daily minimum temperature data from the Applied Climate Information System for the period from September through November. Displayed trend lines on city analyses are based on fitting a mathematical linear regression.